You don't need to be a meteorologist, but awareness of current and upcoming weather conditions can be your best defense against road icing. Before you leave your home or office to commute, or before you embark on a trip, it is imperative to check both the current weather conditions and the upcoming forecast. Pay close attention to the temperature. If your car has a built-in thermometer, check it regularly as you drive. 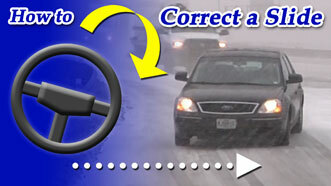 Temperature readings below 36°F should alert you to the possibilty of road icing. 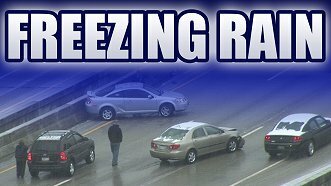 Any type of precipitation falling (snow, sleet or rain) when temperatures are close to or below freezing is the greatest warning sign you can get for imminent road icing conditions. Falling snow or sleet can cause temperatures to drop rapidly, so even temperatures as high as 40°F can quickly fall to below freezing in an area of heavy snow or sleet. During the winter, any type of precipitation can result in road icing, including rain! It doesn't take much of any precipitation type to cover roadways - even a dusting of snow or a light drizzle can make roads treacherous. Ice buildup on your windshield wipers, antenna or other parts of your car can be a sign that ice could already be forming on roads and bridges. Keep in mind that many times, however, the roads could already be icy by the time you notice buildup on your car. 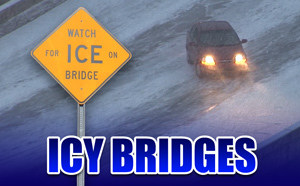 Ice and snow will usually (but not always) stick to elevated objects before it begins affecting bridges and roadways. Look for snow or ice on parked cars, highway signs, guardrails and grassy surfaces.